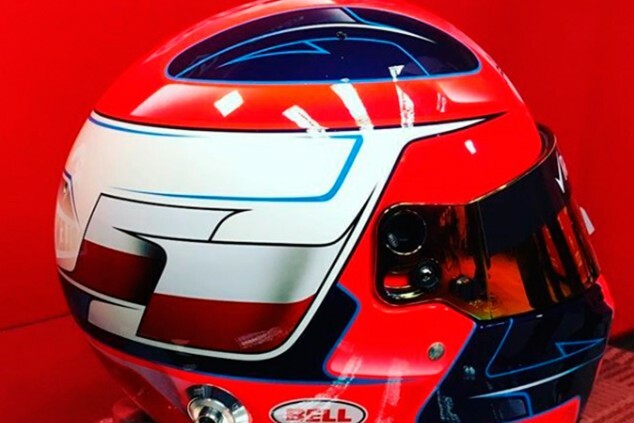 Since Robert Kubica has presented his 2019 helmet today.. here is edition 2019. 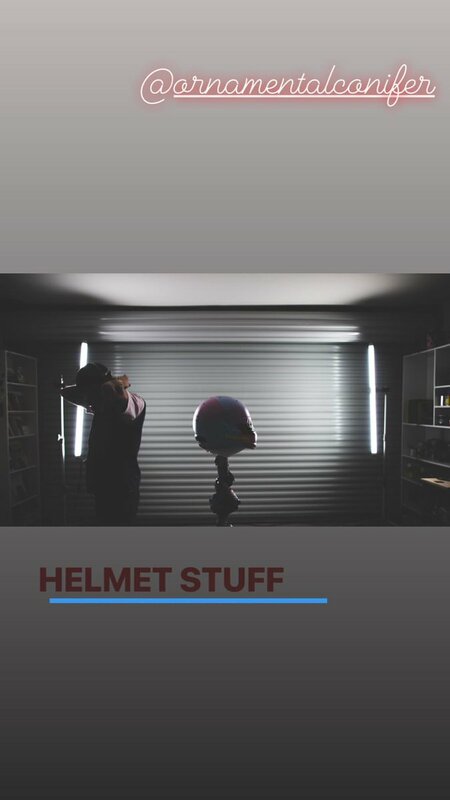 Credits go to cravenciak for posting this before in the 2018 helmet thread. Good lad. I always get a warm feeling when this thread starts again every year. Edited by VladimirBrown, 29 January 2019 - 11:53. Well, I kinda like it too. I dig the design of Kubica. It is striking and very recognizable. I presume Orlen the Polish company bankrolling Kubica? 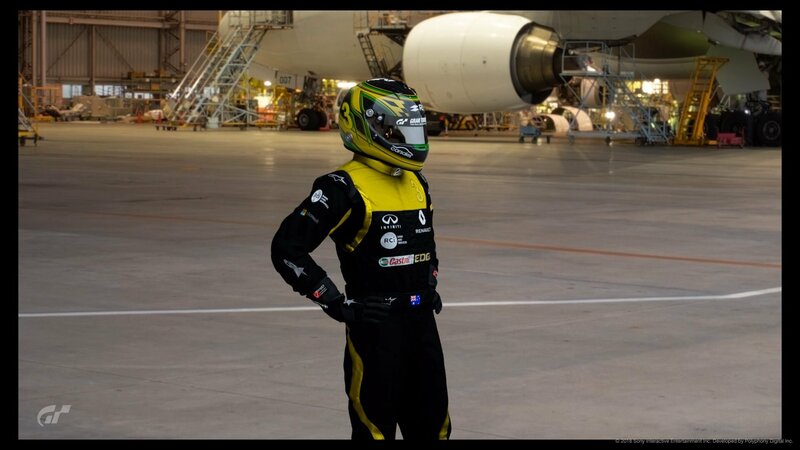 What colour helmet is Russell likely to use? Does he still use that Schumacher-esque red lid? Might be confusing if Kubica and Russell are both in red. Edited by GiorgioF1, 29 January 2019 - 12:59. Nice lid. Hopefully a winning one! Not sure I'm being excessively pessimistic here, but anyone else dreading to see what Ricciardo means when he says his new helmet design is going to be "radically different to any other"? This is also the first look at the new helmets in general for 2019, without the reinforced strip across the top of the visor. 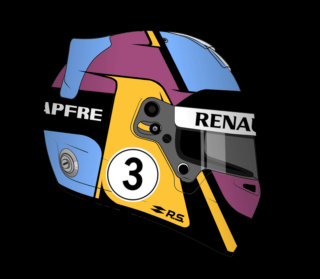 Be nice if Riccardo hand painted his lid, like Wurz used to do. I guess this was just temporary. A shame 'cause it looks pretty sweet. Looking forward to learn about his non-Red Bull style design ! 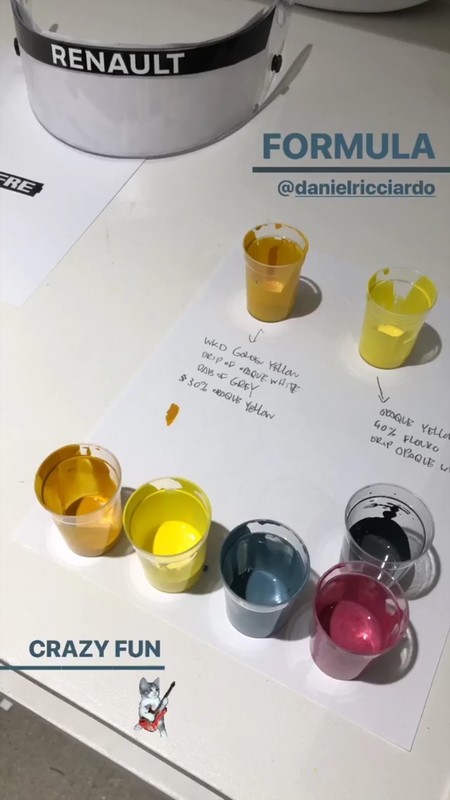 Looks pink/purple and light blue in that pic, and he's planning to add yellow, gold and black it seems. Edited by Alburaq, 30 January 2019 - 05:09. Knowing Danny boy the way he presents himself, it will be likely to be an outrageous design. Kubica had worse helmets. But still this one is kinda of meh, pretty generic and ugly. Edited by Alburaq, 30 January 2019 - 10:07. I came here to read all about Helmets but there's no mention of David Croft. Not to be an expert or anything, but to be honest I think you made that up yourself, which is why you would like it. And I don't think .qzn really means anything. I found similar .qzn files on your own website, so it was just a matter of joining the dots. Edited by VladimirBrown, 30 January 2019 - 10:17. 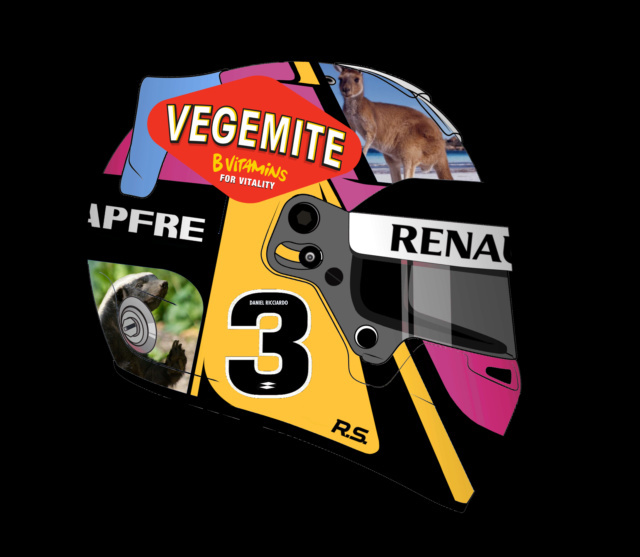 Though I'd be amazed if Ricciardo's helmet doesn't have more prominent Australian iconography on it somewhere. Edited by Alburaq, 30 January 2019 - 11:09. Kubica's design is a mess. All these lightning flash "speed-lines". The old rule - keep it bold, easily memorable and something you could replicate with a packet of crayons, makes absolute sense. 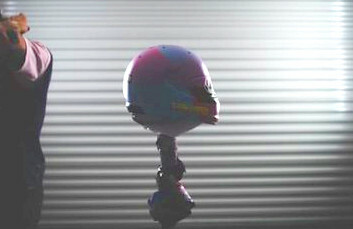 My own helmet design (in avatar here) is better than 90% of the grid! Well diffrent taste diffrent design I would say. I always loved de Rossi moon and sun design. In general i liked the bike helmet designs more than the F1 designs. I really liked the MV orange helmet. None of those really follow youre rule. Yep, far too many of the designs have that nonsense going on. And don't forget the pig snout too! It's the generic F1 driver design now... several variations throughout the grid but just in terms of different colours. And none of the awkward shapes and umpteen overlays go together. It's almost the same for over 13 years now, wtf? Imo it's been a mess for over 13 years due to the spikes and overlays. As have been the designs of many if not most other drivers. I like the spikes and overlays. It's not like they are overblown or something. They are adding to the design imho. This is no bad thing. It's like his signature. Yeah? Good luck drawing that abomination from memory. Or, come to think of it, it wouldn't be too hard- pig snout, check, lots of messy shapes and swooshes, check. There, you're an F1 helmet designer. Very uninspiring helmet design indeed. Why don't we have an Unofficial Helmet Design thread like the livery one? Good idea. Who has a template? I asked for that! Done. So, do we get a red williams with a blue stripe? 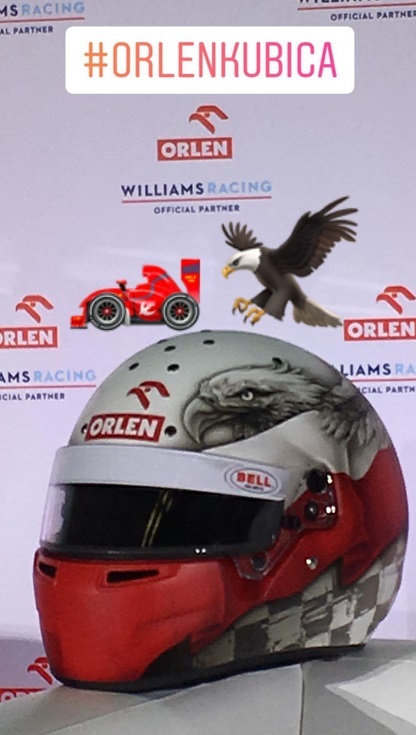 Presume Orlen will feature prominently on the car, in the absence of any other sponsors. I saw on Twitter that the Kubica lid was a gift, so it might not be official. Max should just stick to a mostly orange design... it's the only thing that can make these horrid RB helmets halfway decent.